Canterbury is an historic English cathedral city and UNESCO World Heritage Site, which lies at the heart of the City of Canterbury, a local government district of Kent in South East England. It lies on the River Stour. This building had been a place of worship during the Roman occupation of Britain and is the oldest church in England still in use. St Augustine, the first Archbishop of Canterbury, arrived on the coast of Kent as a missionary to England in 597 AD. He came from Rome, sent by Pope Gregory the Great. It is said that Gregory had been struck by the beauty of Angle slaves he saw for sale in the city market and despatched Augustine and some monks to convert them to Christianity.Augustine was given a church at Canterbury (St Martin’s, after St Martin of Tours, still standing today) by the local King, Ethelbert whose Queen, Bertha, a French Princess, was already a Christian. This building had been a place of worship during the Roman occupation of Britain and is the oldest church in England still in use.Augustine had been consecrated a bishop in France and was later made an archbishop by the Pope. He established his seat within the Roman city walls (the word cathedral is derived from the the Latin word for a chair ‘cathedra’, which is itself taken from the Greek ‘kathedra’ meaning seat.) 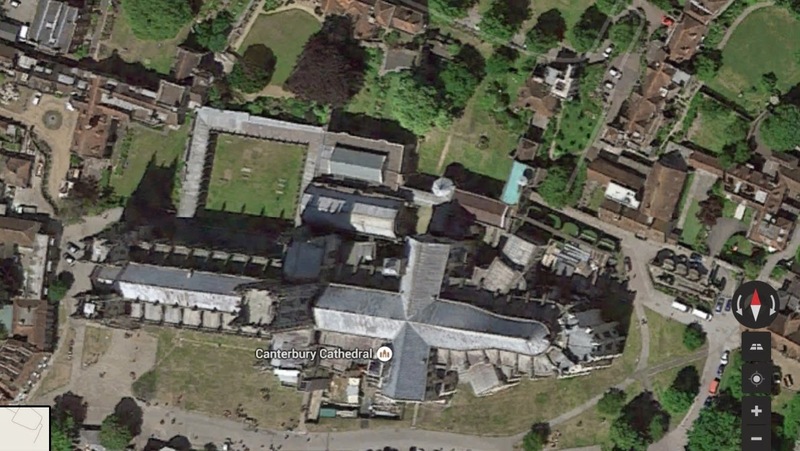 and built the first cathedral there, becoming the first Archbishop of Canterbury. Since that time, there has been a community around the Cathedral offering daily prayer to God; this community is arguably the oldest organisation in the English speaking world. The present Archbishop, The Most Revd Justin Welby, is 105th in the line of succession from Augustine. Augustine’s original building lies beneath the floor of the nave– it was extensively rebuilt and enlarged by the Saxons, and the Cathedral was rebuilt completely by the Normans in 1070 following a major fire. There have been many additions to the building over the last nine hundred years, but parts of the quire and some of the windows and their stained glass date from the 12th century. By 1077, Archbishop Lanfranc had rebuilt it as a Norman church, described as “nearly perfect”. A staircase and parts of the North Wall – in the area of the North West transept also called the Martyrdom – remain from that building. DO U WANT SLIGHTLY LARGE PHOTOS? PLEASE SAY SO IN THE BOX GIVEN BELOW.